BTM Layout (an abbreviation of Byrasandra, Tavarekere and Madiwala Layout) (Kannada: ಬಿ ಟಿ ಎಂ ಬಡಾವಣೆ) is a neighbourhood in South Bangalore, Karnataka, India. BTM Layout got its abbreviated name as it is situated between Byrasandra, Tavarekere and Madiwala. The area is around 45 km away from Bengaluru International Airport and 11 km away from the Bangalore City Railway station. BTM Layout's proximity to Outer Ring Road, Bangalore, Koramangala, HSR Layout, Bannerghatta Road, J P Nagar and Jayanagar makes it one of the most popular residential and commercial places in Bangalore. The 1st Stage of BTM Layout is separated from the 2nd Stage by the Outer Ring Road. BTM Layout is noted for its cafés, boutiques and music venues. It is one of the high growth neighbourhoods in terms of property prices, showing an annual growth rate of close to 60% in early 2010. Madiwala Lake which is home to rare bird species, is also famous in the neighborhood. Also home to BTM Football Club which plays B division football in Karnataka league. ^ "Betting on the south". Deccan Herald. 28 October 2010. Retrieved 17 November 2010. ^ "BTM Layout". Retrieved 14 October 2012. 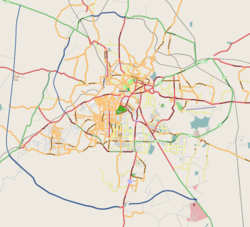 This article related to a location in Bangalore Urban district, Karnataka, India is a stub. You can help Wikipedia by expanding it. This page was last edited on 15 April 2019, at 09:24 (UTC).